A report out of Japan on Monday says that on June 3rd, Apple filed an application with the Japan Patent Office to get a trademark on "iWatch". The Cupertino based company is said to have 100 engineers working on a smartwatch that is expected to have some of the same capabilities found on the Apple iPhone and Apple iPad. The device is believed to be able to read and send text messages, list calls, offer maps and navigation and come with support for multitouch. Other top tech names like Samsung, LG, Google and Microsoft are expected to to produce their own smartwatch and Sony already has had on the market for about a year. The latter device connects to an Android phone and will relay email and texts and allows the user to take calls. To show the demand for such a product, the crowd-funded Pebble smartwatch, which uses a Bluetooth connection to sync with an Android powered smartphone, raised more than $10 million on Kickstarter. Back in February, Apple CEO Tim Cook said that the company was working on "great stuff" that could help reverse the downtrend in Apple's stock. The company has been criticized for the lack of innovation since introducing the Apple iPad in 2010. Recently, speculation arose that Apple is testing 1.5 inch OLED displays that would presumably end up on the Apple iWatch. 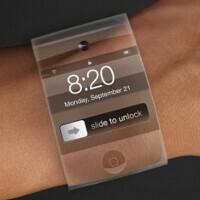 The device alone could eventually add $6 billion to Apple's annual revenue, according to Citicorp analyst Oliver Chen. I can't wait to see what it looks like. Knowing apples flair for beauty and style, it should look quite nice.